Welcome to our first monthly technical update of 2019 — it’s been a month where our developers have had their heads down and have been grinding away. So where exactly did we leave off at the end of 2018? Overall, this has continued to be our focus for the month of January, of which we have made great strides. For further detail, let me give you an idea of where we are at with each item. With any tech startup, you race to get a product out the door that allows the user the minimum functionality to draw them in and use it, hence the term Minimum Viable Product (MVP). We’ve successfully launched our slots MVP last fall and have seen some growth while also being fortunate enough to not have any major issues arise. But with any utility blockchain product, the initial user base is small, typically, they get 10s or 100s of users whereas more centralized platforms get 1000s. Many attribute this to the infancy of the space and the consequent difficulties with the onboarding process, particularly for users who have never seen nor heard of Blockchain or what it can do. Problems need to be solved like; how can a user easily get your token with fiat? How can we create an address that can be easily remembered and communicated for ease of use (i.e. it’s much easier to remember your Paypal address than your public address)? How can we eliminate the fear around performing transactions…I know the first time I sent crypto I checked the address about 15 times because there’s no going back. We think these problems will be solved by the space and in anticipation, we want to have a platform that can handle the influx of 1000s of users. To do so we have been taking our MVP and building out a microservice infrastructure that will be easily scalable, so when that boom happens we will be running smoothly without any hiccups. We’ve been fast at work on our P2P betting markets and have a proof of concept we’ve created to start testing it out. Much of that work we have decided to make public which you can find in this repo. Most notably is our use of the 0x protocol. This could be confusing to some because 0x is an Ethereum product, but the end result of our use is that it allows for cheaper transaction costs. 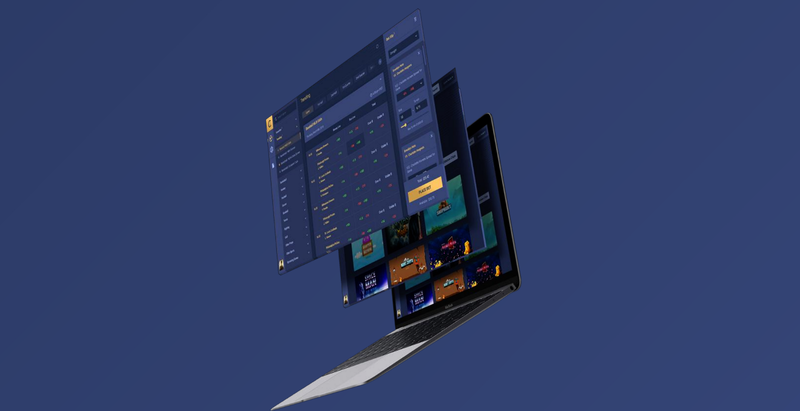 The user won’t need Ethereum or 0x or any other token to bet, this is more just a behind the scenes implementation to minimize transaction costs while still maintaining the level of transparency that is required for any blockchain product. We’re also researching how to implement the MPP protocol that will allow us to cover the VTHO costs for users to place bets. This would result in a user only needing to have DBETs to be able to use our platform. Our belief is that by only requiring one token to play, it will drastically improve our conversion and onboarding numbers. For the front-end implementation of our platform, there was a multitude of factors which had to be considered and decided upon before we chose how to move forward. Obviously, in this day and age, there is a constant push towards native phone apps and we fully agree that mobile usage has far surpassed desktop for internet products. The future is mobile, but the question for us is how best to get there. Typically with a product like this, there’s a good argument to be made for iOS first. iOS has a dominant market share for app store money spent and the gambling industry views app store spending as a strong correlation to what will be spent on a betting product. However, on the flip side, we are an international product and Android use is much larger worldwide, especially in developing nations where crypto adoption has seen the greatest growth due to unstable national currencies. So in an effort to hit both of those demographics, while also minimizing development costs to get a product out the door, we settled on a mobile web product. It won’t have the quality of a native app, but it will be close and able to address everyone while allowing us to only develop in one front end client. There is also the added benefit of not requiring any sort of app store approval, so we can iterate quickly and aren’t beholden to any 3rd party authority to distribute our client. All that being said, native apps are not off the table, in fact, part of the reason our team was put together as it is now is due to their in-depth experience in native app development. We believe it’s the future, just not the best choice for this specific MVP. In my last post, I alluded to some technical developments that we had hoped to announce soon. We’re not quite there to publicly announce anything yet, but we’ve spent some time planning and scoping out our next product release. Once we can publicly announce it I will be happy to get more in detail about the work we’ve put in up until the announcement and what’s required for us to get it out the door. Please follow us in our Telegram and Discord channels so you’ll hear about that announcement as soon as it comes out. I’ll be regularly checking in to see if anyone has any questions about anything technology related. Discord is best for in-depth questions. On the subject of questions, as this update will replace the usual monthly overview (it’s been a development heavy month), please make sure to direct any and all business development to Discord and to our Operations Manager Braden, or any of our other friendly team members.